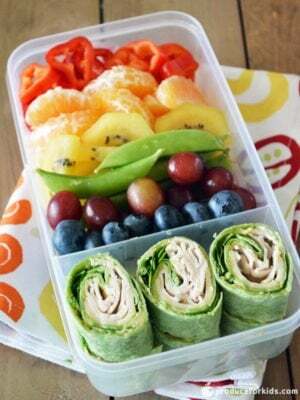 We all know the saying, “Eat a Rainbow!” and with this lunchbox, your kiddos will be! 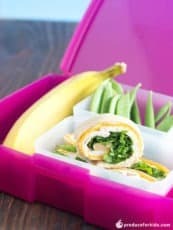 This rainbow lunchbox pairs a variety of fruits and veggies with simple pinwheels filled with hummus, turkey and spinach. The good news is everything is customizable! 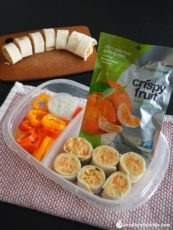 Swap out the colors of the rainbow with your kid’s favorite or switch up the pinwheels with whatever you have on hand. 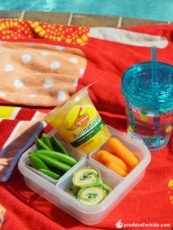 Assemble lunchboxes with peppers, mandarin, kiwi, snap peas, blueberries and grapes.